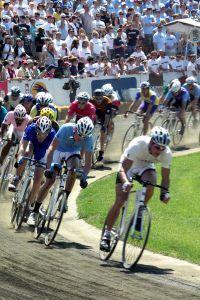 Autographed cycling memorabilia is a popular collectible item among fans of the sport. Many cycling enthusiasts enjoy collecting memorabilia representing their favorite athletes' milestone achievements. Such items are even more treasured and valuable when they are autographed. There are many retailers who specialize in helping collectors find the perfect autographed items for their cycling memorabilia collections. For most sports memorabilia enthusiasts, half the fun of building a collection is searching for hard-to-find items that can separate average displays from ones that are truly remarkable and unique. BicycleGifts.com carries an interesting selection of memorabilia that will appeal to cycling enthusiasts. Items include: original vintage posters, jerseys, posters, greeting cards, jewelry, and more. Bicycle Posters & Prints has a selection of items that will appeal to cycling enthusiasts of all ages. In addition to artwork, the company carries a variety of different types of apparel, cycling-themed ornaments, bicycle models, and gifts. Campyman's World is a great resource for rare autographed cycling jerseys, photos, and other memorabilia. The owner is a cycling journalist. It's Already Signed 4 U carries all types of autographed sports memorabilia, including cycling jerseys, photos, magazine covers, and more. Sports Gallery Web is an excellent resource for high quality framed photographs and coins signed by cycling greats. The Autograph Source specializes in autographed prints, team jerseys, photographs, posters, and more. The Classic and Antique Bicycle Exchange is a forum for those interested in buying, selling, or swapping vintage bicycles, parts, collectibles, and other related items. In the spirit of a collector who is truly passionate about the sport of cycling, Marco Zamberletti has published images from his impressive collection of cycling memorabilia online. Zamberletti has amassed a collection of more than 500 cycling collectibles documenting the sport from its early days through the present. He has posted photos of the most impressive items from his personal collection online. The website also contains a detailed list of items Zamberletti would like to purchase, along with information about the eBay store on which he sometimes sells duplicate items. Cycle Publishing's Bicycle Collectibles book provides a cycling memorabilia pricing guide. CyclingNews.com is an online resource for current happenings in the cycling world. PezCyclingNews.com covers the latest in pro cycling. Pro Cycling Tour lists upcoming professional cycling events, which often include personal appearances and autograph signing sessions by professional riders. TheRacingBicycle.com is an online resource dedicated to the history, preservation, and enjoyment of classic and antique racing bicycles. The site features images of various types of cycling memorabilia from the sport's early days. Collecting cycling memorabilia can be a rewarding and enjoyable pastime for cycling enthusiasts and sports memorabilia collectors. Autographed collectibles can be challenging to locate, but the rewards of adding them to your collection can be great. Remember that truly outstanding collections take time and effort to build.